Edit: I've updated this article to include a number of links and video. See below. It's a year away, but start planning! When: Saturday, February 9th, 2013. Stars vs. Lancers will start at 12:30pm CST. How much: Prices start at $30 per ticket which will get you into both games (Stars vs. Lancers and UND vs. UNO). Tickets will be available for purchase on 10/1/12. The Stars and Lancers will play first at 12:30pm CST. At the conclusion of the USHL game, there will be a 45 minute break. After that, the University of North Dakota will play the University of Nebraska-Omaha. So essentially this will be a double-header. This event will be called "Battles on Ice" and will be sponsored by Mutual of Omaha. Tickets to this event will be available for purchase on October 1st, 2012 and they will be sold at the CenturyLink Omaha box office and Ticketmaster. 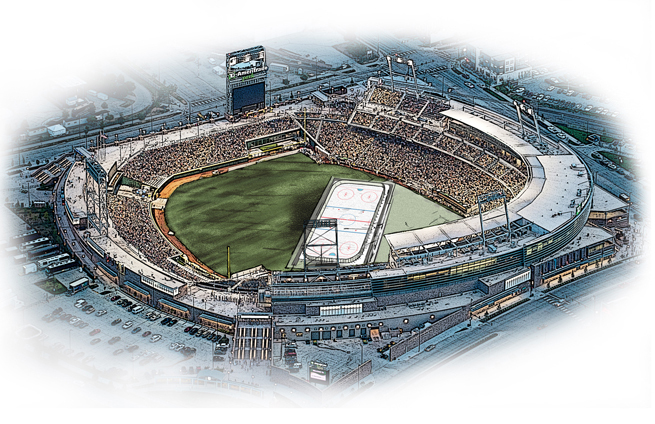 Click here to view the TD Ameritrade Park website. The baseball stadium where the NCAA College World Series is held can hold 24,000 fans. This should be a very fun event! Maybe we could plan a big B³-Stars tailgate where a lot of Lincoln fans could gather before the game. Hopefully the weather cooperates because February in Nebraska can get really nasty if it wants to. Roll call! Sound off if you'll be there. I can't wait! 2/14 Edit: The official announcement was made today. I'll update this article to include links to articles below. Stars' President Jim Pflug stated on 1480AM ESPN radio today that the organization will make special arrangements for season ticket holders to purchase tickets to this outdoor event. Here's video from WOWT News out of Omaha. (foxrod)Will be there for sure!! They should habe the stars and lancers squirt teams play too! !